We all have busy lives these days and so a quick meal is often the answer to a hectic schedule. 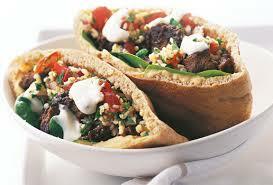 This dish is so tasty, with all the flavourings and spices that are typical of North African cooking. The pitta bread is stuffed with beautiful grilled meat, salad and yoghurt. It doesn't have to be lamb - use other minced meats if your prefer. Put the coriander and cumin seeds into a small frying pan without oil and fry until they start to brown and release their aroma. Let cool slightly then grind to a powder in a spice grinder or with a pestle and mortar. Heat the oil in a frying pan, add the onion, garlic and ground spices and fry gently for 5 minutes until softened, but not golden. Increase the heat, add the lamb and the salt and stir-fry for 5 to 8 minutes until well browned. 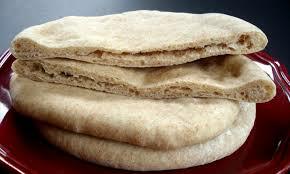 Meanwhile, lightly toast the pitta bread and cut a long slit in the side of each one.